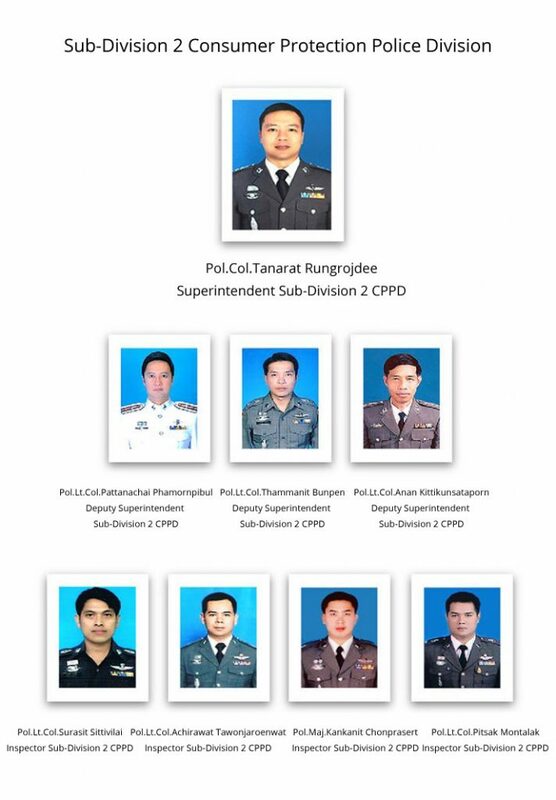 Sub-Division 2 is responsible for peace and order keeping, prevention and suppression of crime concerning consumer protection, to investigate, inquire and operate according to the Criminal Procedure Code of Thailand and other related laws about consumers protection and other related offenses all over the Kingdom of Thailand (except Bangkok Metropolis), including joint operation with or support the other organizations’ operations related to the assigned mission. Forbidden Interest Charging over Legal Rate Limit Act, B.E. 2547 (2004) and other related Acts. Chaengwattana, Thung Song Hong, Laski, Bangkok 10210, THAILAND. The main unit of the National Police Agency. To enforce the law on consumer protection. Standard food and pharmaceutical industries with professional expertise. As the faith of the people.